Len Aruliah is a freelance musician active in London and Vancouver. He released his first album Full Circle in 2007 with a quartet playing his compositions and has recently recorded current works with a new sextet. In London, Len has worked with the Charles Condy Quartet, Paul Weinreb’s Tarantula, the Hot Orange Big Band, the 4Seasons Band, and his own groups. He has also toured the UK with singer Gene Pitney, worked in theatre orchestras in London’s West End, and has toured the world performing on cruise liners. Len studied at UBC and the Banff Centre, working with great musicians such as Julia Nolan, David Branter, Stan Karp, Fred Stride, Hugh Fraser, Kenny Wheeler, Pat LaBarbera, and Don Thompson. Len holds a B. Mus. degree from UBC and is an experienced music educator, having worked in various London colleges, academies, and schools. He has recently worked with students at Capilano University to perform his compositions. He has taught at the South Delta Jazz Workshop since 2005, and last year was guest composer for the Faculty Concert. Dr. Jared Burrows is the Academic Coordinator of the Jazz Studies Department at Capilano University and teaches improvisation, conducting, arranging, and directs small and large ensembles. He is a dynamic force on the Vancouver scene as a performer, composer and community organizer. He works in a huge variety of ensembles in jazz, new music, and world music settings and leads the Jared Burrows Quartet and Sextet and the Vancouver Improvisers Orchestra. Jared performs as a sideman with Dave Robbins Electric Band, the Offering of Curtis Andrews, Sancharam Trio, Delta Quartet, Michael Vlatkovich Quintet, Colin MacDonald’s Pocket Orchestra, Koan, Len Aruliah Sextet, and the Brad Muirhead 4tet, to name only a few. Jared holds a PhD in Arts Education from Simon Fraser University. His doctoral research explored an alternative paradigm for music education based on improvisation and his thesis supervisor was the pianist and philosopher, Yaroslav Senyshyn. He has a MMus in Jazz Studies from the University of Oregon where he was mentored by the great educator and musician, Steve Owen and studied composition under Robert Kyr and David Crumb. His early teachers included Rudolph Komorous, Martin Gotfrit, David MacIntyre (composition) and Ihor Kukurudza (guitar). Kevin Lee was born in Vancouver where he lived until he was 10 years old. He moved to Surrey where he started playing trumpet in school bands and local community bands which toured in many areas of Canada, USA, & Europe.After High School, Kevin attended Douglas College to pursue studies in Music Education. Kevin transferred to Western Washington University where he graduated with a Bachelor of Music Degree in Jazz Studies. After University, Kevin began a career as a professional musician freelancing with many types of groups ranging from jazz combos, big bands, cruise ships, studio sessions to orchestras. Kevin also worked as a composer/arranger. In the early 80’s, Kevin moved to Los Angeles, California to study arranging/composition as well as study trumpet. After his time in Los Angeles, Kevin returned to Canada and resumed working as a musician and eventually joined a Ska Band called SkaBoom. SkaBoom became one of Vancouver’s most popular bands and eventually became well known in major centres across Canada as well as parts of the USA. SkaBoom performed, recorded and toured for many years with songs climbing the airwaves in many areas of Canada and the USA. SkaBoom produced a music video of their popular song Love & Affection that received airplay on Canada’s Much Music TV Station as well as some airplay in the USA and UK. While still playing and touring with SkaBoom, Kevin became a substitute music teacher at the request of the Surrey School District. Kevin fell in love with teaching and decided to become a full time music teacher and enrolled at the University or British Columbia where he received a Bachelor of Education Degree in Secondary Music. Over the years, Kevin has recorded for radio commercials, movie scores, television shows, as well as a variety of CD/Record projects. Kevin has performed with a variety of musical groups and has performed in festivals across Canada and the USA. As a teacher, Kevin works in the Surrey School District where many of his bands and students have received awards and recognition in Canada and the USA. He enjoys all aspects of making music and teaching the art of making music. Rob has been a regular at the Stanford Jazz Workshop since 1991. He has held various titles, including; Education Director, Jazz Camp Faculty Coordinator, and Combo Coordinator. Besides teaching combos and Bass Master Class, he has taught Beginning Theory, Intermediate Theory, as well as Advanced Theory. He is mostly known as a bassist however and has performed in concerts, workshops and master classes at SJW with a list of world class players that includes; John Stowell, Jeff Ballard, Stefan Karlsson, George Garzone, Don Hass, Ndugu Chancellor, Tootie Heath, and Dana Leong to name a few. 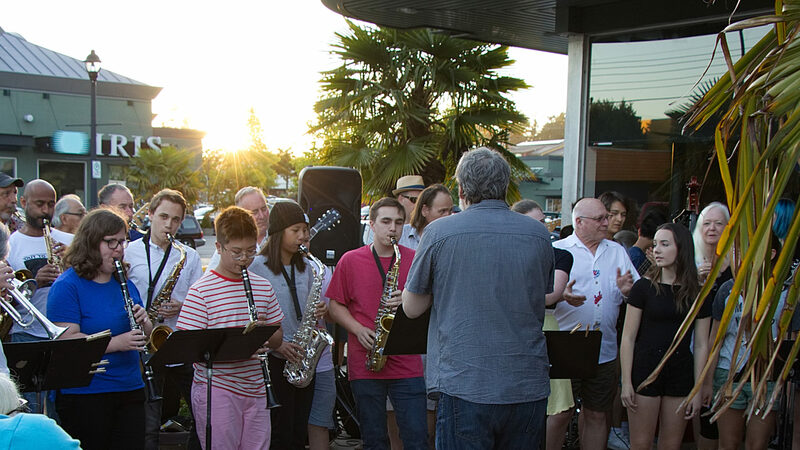 Besides the SJW, Rob has been an integral part of the South Delta Jazz Workshop in Vancouver B.C. as well appearing annually at The Vancouver International Music Festival since 1998. He has also been on the faculty at the world re-known New Orleans Center for Creative Arts. While at NOCCA he created and directed a middle school program as well worked with at the high school during the school year and their summer sessions. As a composer Rob has been the recipient of two NEA Grants and his originals have been featured on numerous recordings. He is currently Adjunct Professor of Bass performance at MSU. Brad Muirhead – trombone, Workshop Co-director. Brad Muirhead is well known to audiences across Canada and Europe for his powerful sound and inventive improvising and has been involved in the Vancouver music scene as a performer, composer and arranger for more than 20 years. He has recorded and toured extensively with his own groups Primal Orbit and Brass Roots as well as the NOW Orchestra, Hugh Fraser’s VEJI, and the Hard Rubber Orchestra. His latest original projects as a leader are “The Brad Muirhead Quartet”, his original modern jazz outlet and “Propulsion”, a hard-hitting jazz/funk horn band with Brad on Tuba-bass. Brad has been very active as a music educator and has held such positions as Coordinator of the Banff Summer Jazz Workshop, Producer of the Vancouver & Victoria International Jazz Orchestra Workshops and Artistic Director of the Renfrew Community Performance Project. Stephen is an accomplished clarinetist jazz pianist, saxophonist, and arranger performing both classical chamber music and jazz idioms, performing the gamut from classical clarinet, chamber and orchestral repertoire to jazz standards, original compositions and free improvisation. Stephen is a graduate of Queen’s University at Kingston, McGill University in Montreal and the University of British Columbia in Vancouver. Currently Stephen is Music Director of the Delta Community Music School, and the Music Director and Principal Conductor of the Richmond Delta Youth Orchestra. He teaches clarinet and saxophone at the Delta Community Music School and the VSO School of Music in Vancouver. Guitarist/Composer Ron Samworth has been playing and teaching music professionally for over 30 years. Critically acclaimed as one of Canada’s leading jazz guitarists and improvisers, Samworth brings his passion for jazz, rock, blues, classical, pop and folk music together in a fusion that represents the breadth of his musical experiences. He leads the celebrated Vancouver ­based quartet Talking Pictures and co­directed the NOW Orchestra for ten years and the Indie rock bands Darkblueworld and the Luscious. He is also a member of the Peggy Lee Band, Birds of Paradox and the Hard Rubber Orchestra. Ron teaches in the jazz studies program at Capilano University. Jennifer is also a highly experienced instructor, teaching jazz workshops and vocal classes throughout North America each summer and is on the faculty at Capilano U. in North Vancouver. Veteran Canadian jazz drummer Stan Taylor has been an integral part of the Vancouver jazz scene for more than 27 years. Stan has played with such artists as Kenny Wheeler, PJ Perry,Vinny Golia, Pat LaBarbara, Ray Anderson, Rob Blakeslee, Fraser MacPherson, Mike Stern, Glen Spearman, Peter Brotzman, Hugh Fraser, and Paul Plimley. In the1990s Stan co-led the legendary Kane/ Taylor Explosion which toured and performed in Canada and the US with the Kokoro Dance Company. Current projects and collaborations include Kane/Taylor Explosion featuring Noelle Pion, Norm Quinn’s Q5 Jazz Collective. Ian Coleman Trio, Lorne Kellett Trio and many others. Stan is actively involved in recording and performing with these groups and is the faculty drum set instructor at the Delta Community Music School. Rob Kohler is a bassist who has performed jazz, classical, and pop music all over the world. His playing, composing, and producing skills have appeared on recordings by groups such as the Jared Burrows Trio, the Olem Alves Band, Three Form, This World, and the Platt/Kohler Trio. Rob is a regular performer at the Bozeman Bass Bash in his native Montana and has also toured and performed with such artists as Stefan Karlsson, Alice DiMicele, Madeline Eastman, John Stowell, Danny Gottlieb, Nancy King, Brian Bromberg, and Art Lande. In addition to his amazing performing skills, Kohler has had a long and successful career as a private tutor and school music teacher. He is currently based in Los Angeles, California and also works in San Francisco with the Stanford Jazz Workshop as a faculty member and administrator.